Ultimately, I had hoped to build an alphabetical index of domains by which the gods could be referred. However, I realized how nearly impossible that task could be (possibly taking longer than laying out the whole book, if you can believe that). For example, for Erik Tenkar's Pandantilus, Lord of the Privy and Patron of Gong Farmers and Muck Rackers, I suppose I could create entries for "privy," "gong farmers," and "muck rakers," but that doesn't even begin to help DM's who might be looking for "feces" or something similar. Hell, even "gong farmer" can be "gongfermor," "gongfermour," "gong-fayer," "gong-fower" or even "gong scourer." 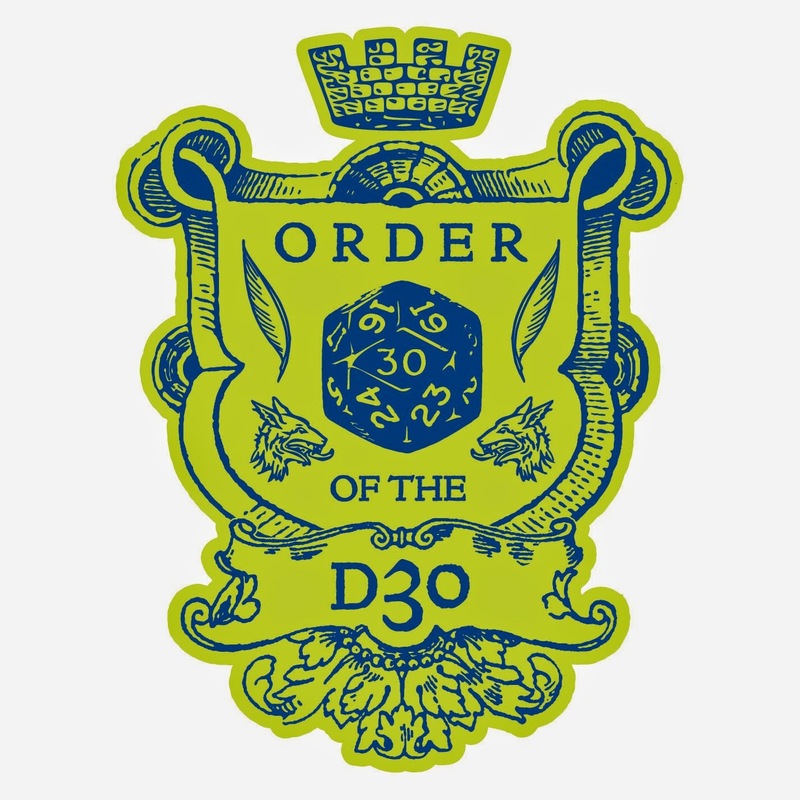 Also, since the domain of so many of the petty gods are quite inclusive, building an exhaustive list would require re-reading each of the 315+ petty gods entries, adding a who-knows-how-long list of associated words, and trying to build the index from that. This is why building an alphabetical index by topic that would be truly useful seems to be near impossible (from my POV). So I've made an executive decision. I've laid the index out alphabetically, with the gods' names, domains (as listed in each entry's header), alignment, affiliations (pantheons/cults), and page number. The entire section is 9 pages long. I think that's short enough for DM's to peruse in a few minutes and find a petty god that may fit their needs, but complete enough to actually be useful. Even building this index still took several hours. Imagine how long it would have taken to build the other one. 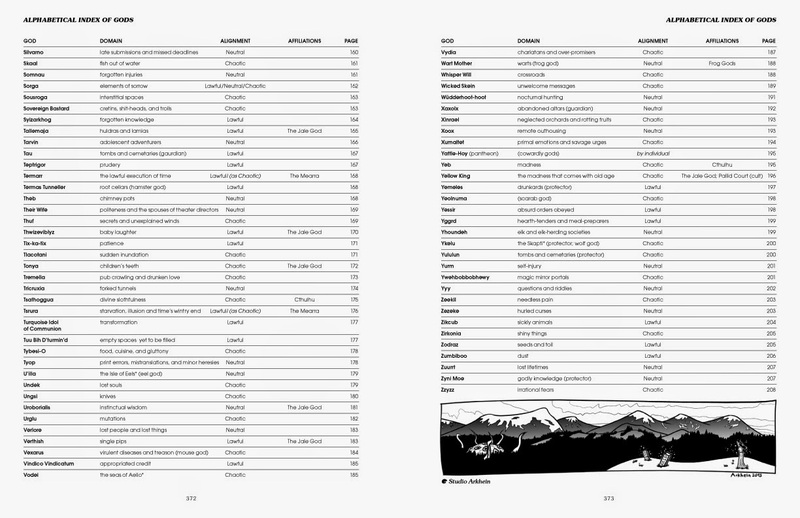 It took me about three hours this evening, but I finished the writer's index for Expanded Petty Gods. I definitely think the work was worth it. One of the things I did when I rebuilt the spreadsheets at the inauguration of my leg of this project, was to split out the last names and first names for all writers and artists, with this absolute goal in mind... being able to alphabetize by last name. Once all the art is completed for the book, I'll do the same thing for the artists. So tonight, I had to finish adding the page numbers (from the layout) to the Excel spreadsheets I've been using to manage each section of the project. Then I took just the columns for page number, writer's last name, and writer's first name from each of the master Excel files, and kept adding those to a single new Excel file. Then, in that composite Excel file, I ordered the columns: 1) last name, 2) first name, 3) page number. After that, I sorted them in that same order (ascending by Column A, then Column B, then Column C). Doing that also showed any inconsistencies in how a single person's name might appear. 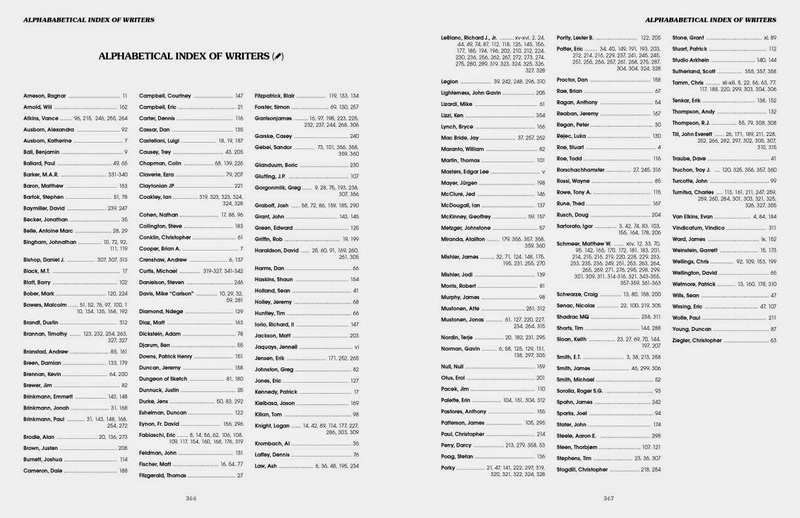 This allowed me to proof and edit the names (not just in the index, but double-checking them in the layout as well). From there it was just a lot of selecting boxes and "clearing contents" in Excel, followed by some "find/replace" in TextEdit, to create the final text file I imported into the layout. Ironically, the actual typesetting of the 2 pages took about 10 minutes. It was the three hours of prep-work that took all the time. As I'm winding down the production of Expanded Petty Gods and getting to the point where nothing is left but a couple of dozen pieces of art and the proofing rounds (which will still take another month or so), I'm trying to get back finishing up a couple of New Big Dragon products that were near completion before I dove into finishing Expanded Petty Gods. 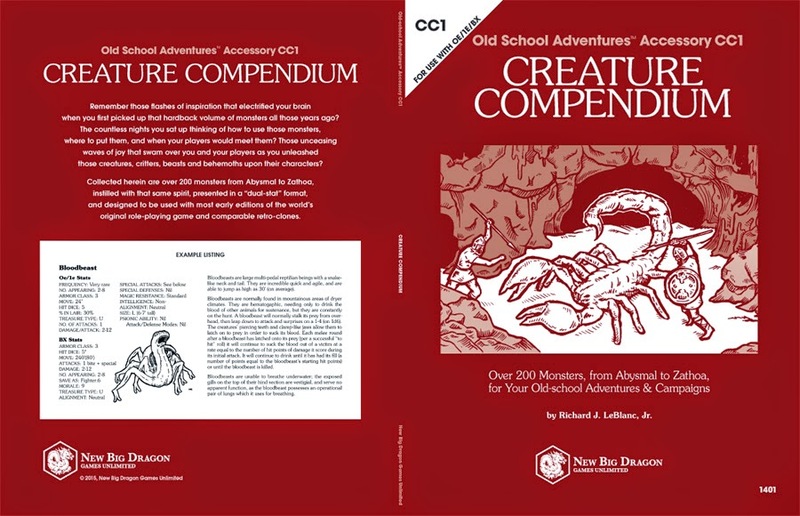 Number one on that agenda... the Creature Compendium. Welbo and I had a chance to make a pass of some monster tweaks last night, and plan another round before the end of the weekend. That means the final version will hopefully be in the proofer's hands next week. 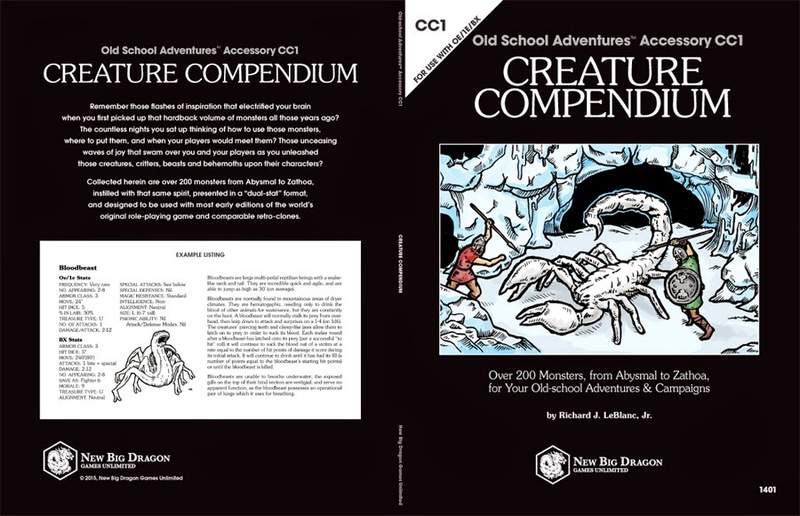 One of the things I'm considering for Creature Compendium is putting out two versions... the "Standard Edition" I've planned all along (the top image below) and a "Premium Edition" (the bottom image below). The only physical differences between the two editions will be that the Premium Edition will have a black cover with a color illustration, and the interior paper will be of a higher grade (possibly). I'm planning on some deliverable differences between the two, however. 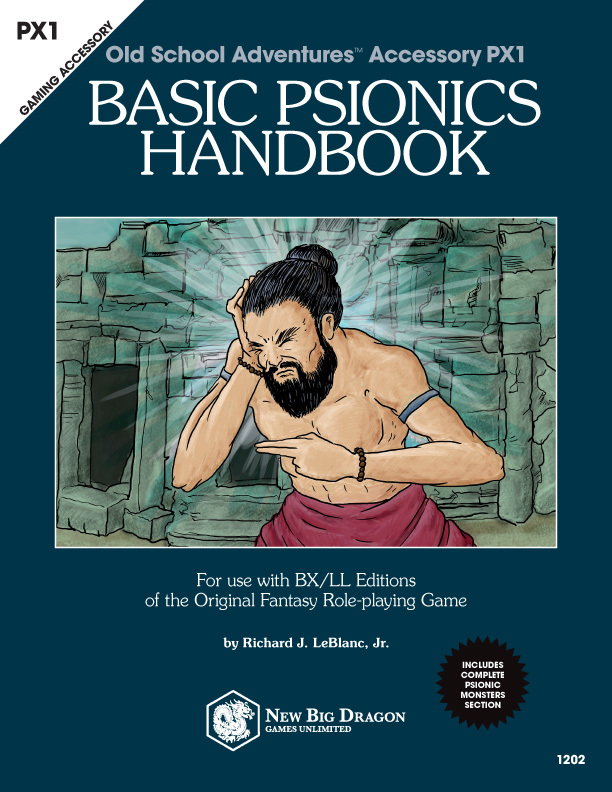 The Standard Edition will be available through Lulu at a "value" price, and the PDF will have to be bought separately from RPGNow (but it will also be "value" priced). However, for about the same total cost of the value-priced PDF plus print edition, you will be able to get the Premium Edition. The Premium Edition will be available directly from the New Big Dragon Storefront, and will include a free PDF with the Premium Edition color cover (the standard PDF will feature the monochrome cover; this color cover PDF version will be available only to purchasers of the Premium Edition). I'm also considering adding to the Premium Edition a free print copy of a new mini-module (a PDF of which will be available for free to anyone at RPGNow). Even better news, I'm looking at changing the shipping options on the New Big Dragon Storefront to go from Priority Mail to Media Mail, getting rid of the added shipping charge for U.S. purchases, and OFFERING AN INTERNATIONAL SHIPPING "ADD ON" OPTION!!! I rarely do reviews around here, preferring to limit my posts to one of the following: new content for the game table, updates any of the various gaming projects with which I'm involved, informative pieces for RPG self-publishers, cool old RPG-related stuff that might otherwise go unnoticed, or historic looks at really old old-school art. So think of today as more of an exception, rather than an introduction. For a couple of years now, I've been a fan of the History Channel's series Vikings, but really as more of an extension of the Barbarians documentary series. But this as I watched "Mercenary", the season 3 premier episode of Vikings (which my DVR recorded a couple of days ago), I sat there feeling like the show has sort of lost my attention (and has me considering canceling my series record settings on my DVR). It took me most of the episode to figure out why, and when I did, it turns out it's really pretty obvious... more and more the series seems to be over-saturating my retinas with panoramic landscape shots and extended battle scenes. This shouldn't surprise me; after all, it's the visual heart and soul of almost every History Channel documentary ever made on this subject matter. What it lacks (IMHO) is the director's sense of what's happening in the scene. Compare Vikings to something like Breaking Bad. In Breaking Bad, as a general rule of thumb, every scene thoughtfully explores what's happening below the surface in that scene, and visually constructs the scene to support the emotion of that scene. In Vikings, more and more I'm getting the feeling that the composition of the shots is more important than what's happening in the scene; what I end up getting is a melange of unemotional panoramic shots showcasing the water or the mountains, or what's being loaded onto the boats, rather than what is happening between characters or with individual characters. And when I do get a close-up, it's really just a way of launching into the scene, and has nothing to do what's going on with the characters in the scene. In TV fiction, I want engaging characters and storytelling (dialog, direction, cinematography) that support that. Maybe if I was getting some informative historical narration over the imagery, I'd feel like I was getting more out of it. To quote Marlene from Seinfeld, "It just didn't make it for me. It's just so much fluff." I don't have much time, so I'll keep this short and sweet. Art from the title page through the introduction is complete. Art for the "Petty Gods" section is complete through the M's (minus a couple of small column filler illustrations). There are still a handful of illustrations to be completed for the rest of the "Petty Gods" section and the "Minions" section. Art for the "Cults" section is complete. There are a handful of spot illustration spaces for the "Divine Items" and "Spells" sections, and only 1 space in the Appendix. I'm not going to worry about these until the rest of the artholes are filled.